What’s more fulfilling professionally than enjoying the work you do and the people around you? My short answer: having the opportunity to work with colleagues to do our small part to support a cause that’s doing amazing things for the lives of D.C.’s most vulnerable residents. Earlier this year, PCG began a partnership with Bread for the City, a D.C.-based non-profit organization that provides food, clothing, legal and social services, medical care and a host of other comprehensive services to those in need in the District. 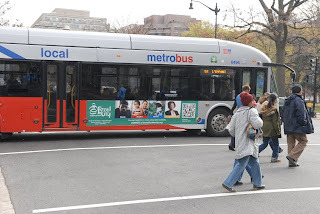 As a first endeavor, our project team, which includes Karen Heinold, Barbara Longsworth and myself, developed an advertisement that appears on several Metrobuses in the District through the end of this year. The intent is to encourage pedestrians and others to support BFC’s Combined Federal Campaign (#61733) and United Way Workplace Campaign (#8219). We incorporated a QR code in the body of the ad so that people can easily scan it and make a donation right on the spot. It also allows those interested in giving to save the donation link from their smartphones and electronic notepads to reference later.